Opportunity Rover Wheel - Solar System Planets And Moons Section. Problem with Opportunity's Front Wheel. NASA's Opportunity rover has lost the ability to steer its right-front wheel, making it more difficult for controllers to maneuver it around on the surface of Mars. 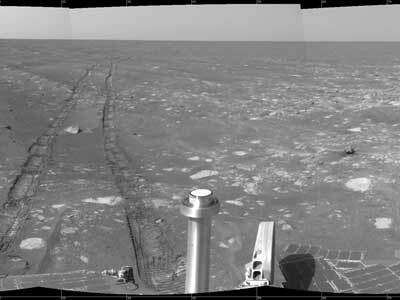 The problem happened on April 13 (sol 433) when the rover was executing a turn - its wheel stuck at a slight angle. The rover has continued to travel since the problem happened, and can make observations, but it's more difficult to make precise movements.